The European Union will not fund the Palestinian Authority under Hamas if it does not renounce violence against Israel, Germany's chancellor has said. Angela Merkel's comments came after talks with interim Israeli Prime Minister Ehud Olmert in Jerusalem. The EU, the PA's largest donor, gives the Palestinians $606m (£341m) a year. Washington has already warned that aid worth $400m (£225m) could be cut following the Islamic militant group's surprise victory in Wednesday's polls. The US and the EU classify Hamas as a terrorist group, and its win is expected to pose problems for efforts to restart peace talks with Israel. The group has carried out many suicide bombings against the Jewish state and refuses to recognise its existence. The "quartet" of powers working for peace in the Middle East - the US, UN, EU and Russia - will hold talks in London on Monday to discuss the Hamas victory. Mrs Merkel told reporters it would be "unthinkable" for the EU to continue funding the Palestinian Authority if Hamas did not change its positions. "Such a Palestinian Authority cannot be directly supported by money from the EU," Mrs Merkel said at a joint news conference with Mr Olmert. For his part, Mr Olmert said Israel had no intention of passing money to the Palestinians that would be used for terror. Israel has already cast doubt on its willingness to continue to transfer customs and tax revenue, worth $50m (£28m), collected on behalf of the PA. But Mr Olmert did not say whether Israel would suspend its regular payments of tax revenues if a government led by Hamas took office. Correspondents say the poll result creates a huge dilemma for the EU and US. 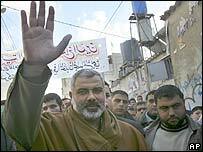 There is broad agreement there can be no negotiations with Hamas unless the group renounces its stance, the BBC's Jon Leyne in Jerusalem reports. But it will be much harder for the West and Israel to cut off all ties with a Palestinian government run by Hamas, our correspondent says. The PA is heavily dependent on foreign aid and the tax payments Israel hands over every month. Our correspondent says that without such funding the PA would collapse and disorder in Gaza and the West Bank may descend into chaos - which is in nobody's interest. 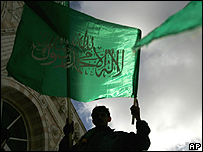 However, Hamas has said it has no plans to disarm and has rejected Western threats to cut aid as "blackmail".